A versatile take on Hummus. 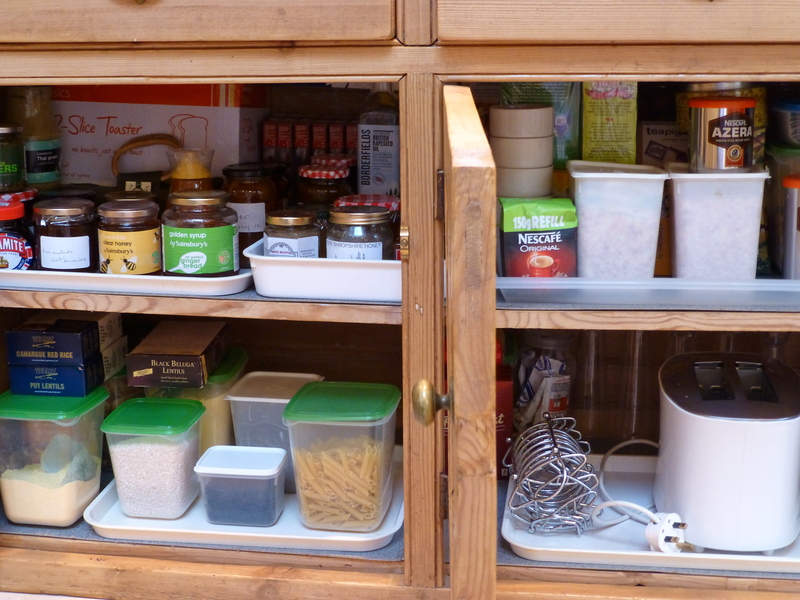 Great to have sitting in the fridge as a ready snack, especially for those of us who are wheat free so need an alternative to bread or biscuits ready to grab, to combat the 5pm slump… Or whenever a burst of energy is needed! If using as a dip / starter, crush chickpeas up a bit more – but not as pulverised as you would for hummus. Serve piled onto baby Romanie Lettuce leaves, or crisp crackers. 1 – 2 cans of chickpeas, gently heated for around 5 minutes to make them easier to crush. Drained. 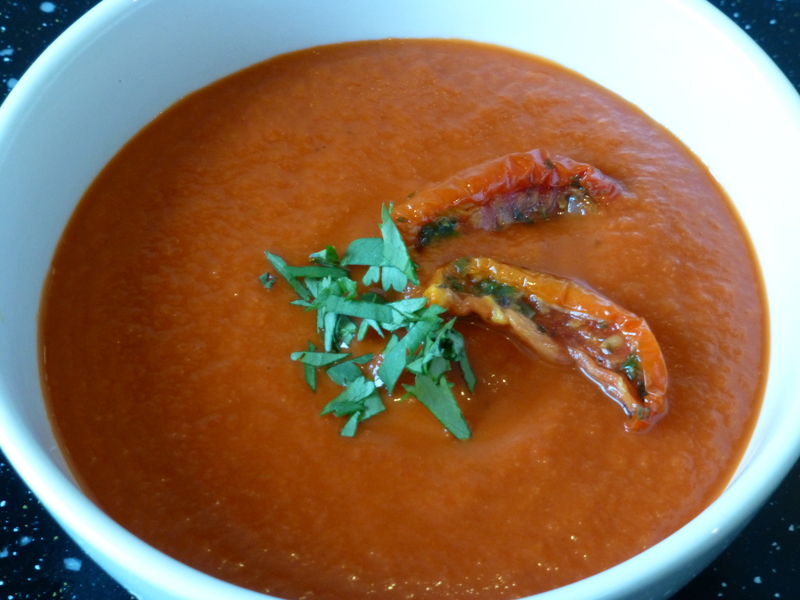 – Mix the tomatoes with the teaspoon of olive oil and the salt. more. Remove from oven and set aside. potato masher. You want to keep plenty of texture. – Stir through the roasted lemon slices and tomatoes, fresh chopped parsley and cumin seeds. Season to taste. 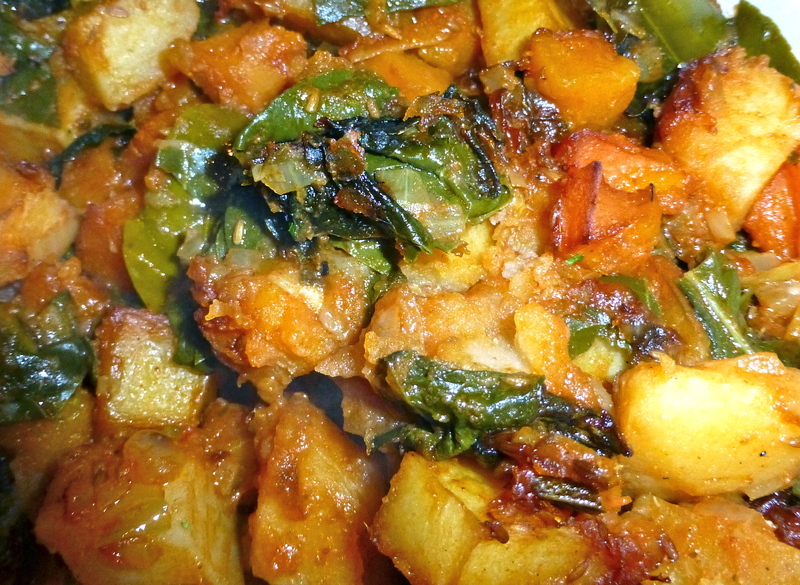 – Serve at room temperature with crackers, lettuce or crusty bread. 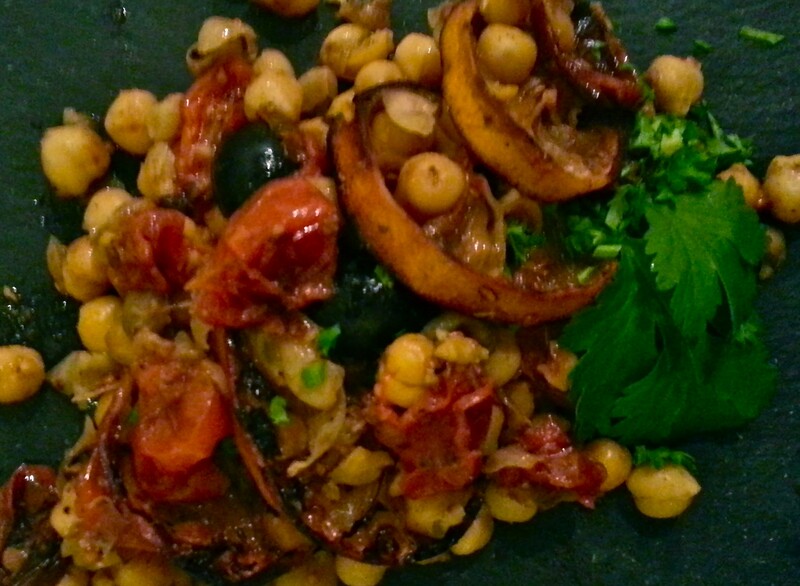 Chickpea, Roasted Lemon, Roasted Tomato, Black Olive & fresh parsley Smash. V, W/f, D/f. 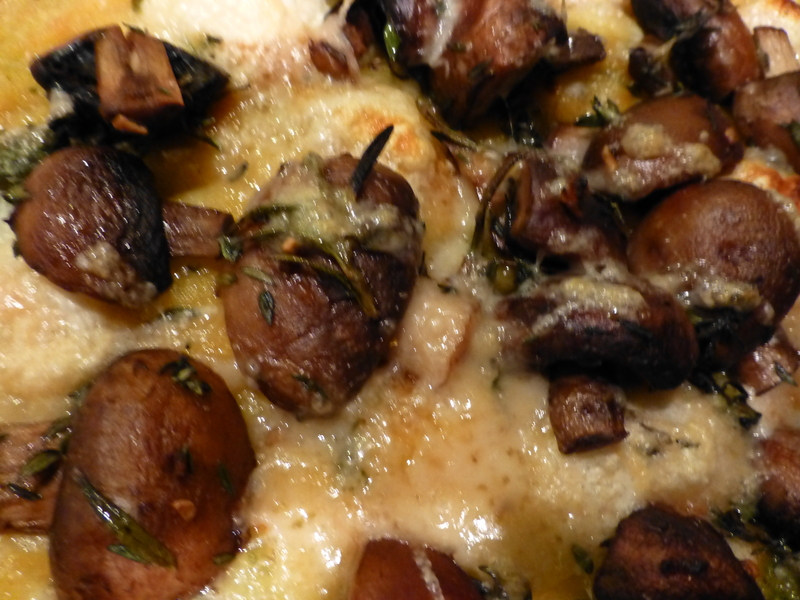 Recipe originally from the Waitrose magazine – altered slightly, to suit. What’s your stand-by ‘pick me up’ snack? Despite the cold and frosts of winter, some of my favourite, most beautiful & versatile vegetables have survived in the garden… And have proudly grown to gigantic proportions. Less tender than when young, but still packed with flavour and nutrients. We wanted to find a recipe that would let us indulge and enjoy, while waiting for this year’s newly planted seeds to spring into life. Hot Red Chard ‘Bright Lights’. ‘Bright Lights’ – even in the winter; on a good day, anyway. 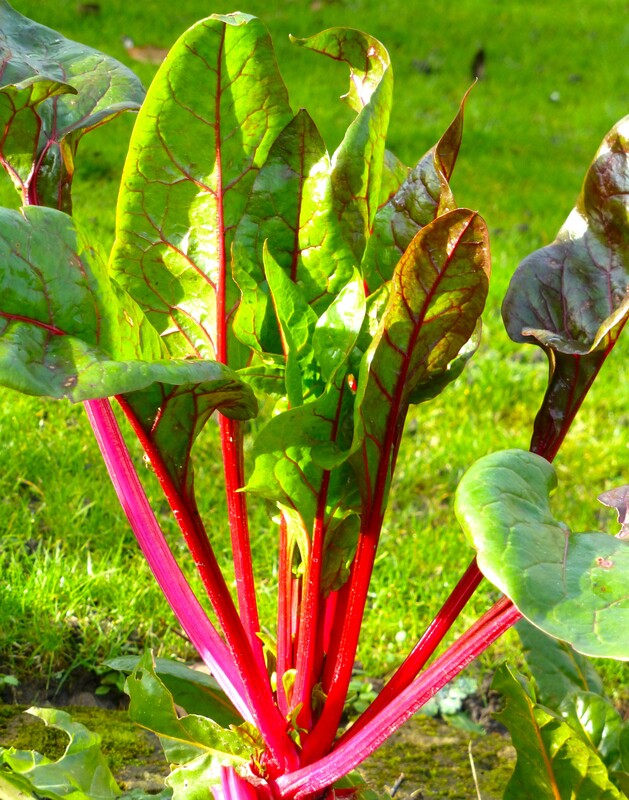 I’ve just planted seeds out for this year’s batch of Rainbow Chard (we always grow a variety called ‘Bright Lights’ ). Chard makes a striking, fun edging to flowerbed boarders if you haven’t got the space or inclination for a veg patch. It can be eaten in a similar way to spinach, and has similar nutritional benefits – just more colourful, hence the name. We adjusted the ingredients using fragrant, freshly picked leaves from our lime tree, lemon slices in place of the fresh limes and chard leaves from the garden in place of the spinach. Ottolenghi’s Iranian Vegetable Stew with Lime. Can be made Vegetarian, Wheat / Dairy Free. What is your favourite recipe using home-grown produce? We have enjoyed a tasty exploration into the world of vegetables over winter, celebrating a wide array of flavours and combinations. Home made soups can be so nutritious, packed with flavour, richly smooth or rustically chunky, and versatile. Simply and quickly made. Comforting and bursting with natural wonder. All can be made vegan, wheat and dairy free. The three shown here are amongst our top tastes for this season. By varying the amount of stock used, or omitting it altogether, you can make them thicker to serve as a sauce to pep up plain vegetables, fish or poultry. 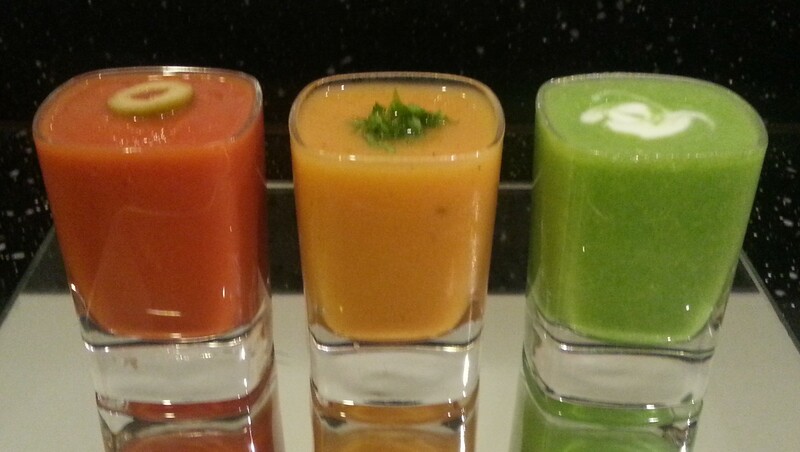 Tomato Soup, Sweet Potato and Butternut Soup, Pea Soup. The smell of hot soup, cupped in a deep bowl as I sit in front of a dancing fire, is as much part of winter as dark walks to work and chilblains on my toes. Ouch. 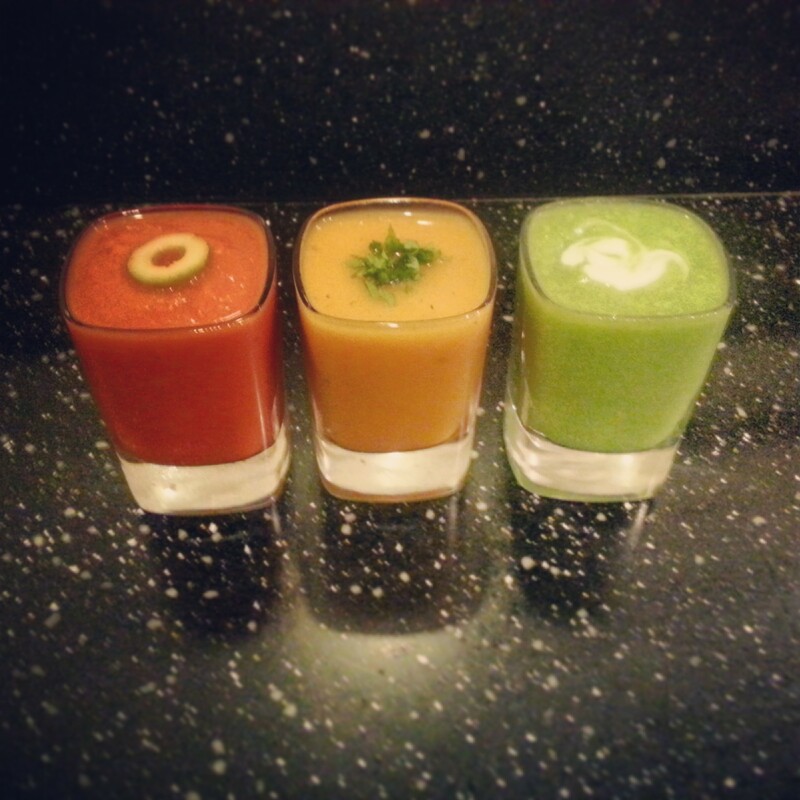 Last night, to start a special evening, we served three soups; chilled rather than hot, in tiny shot glasses as interesting, colourful appetizers. I love tiny tastes – conversation pieces to break the ice; easy accompaniments to drinks before dinner. The details below are not so much recipes as guidelines. I like to make my soups very simply, adding just a few ingredients. 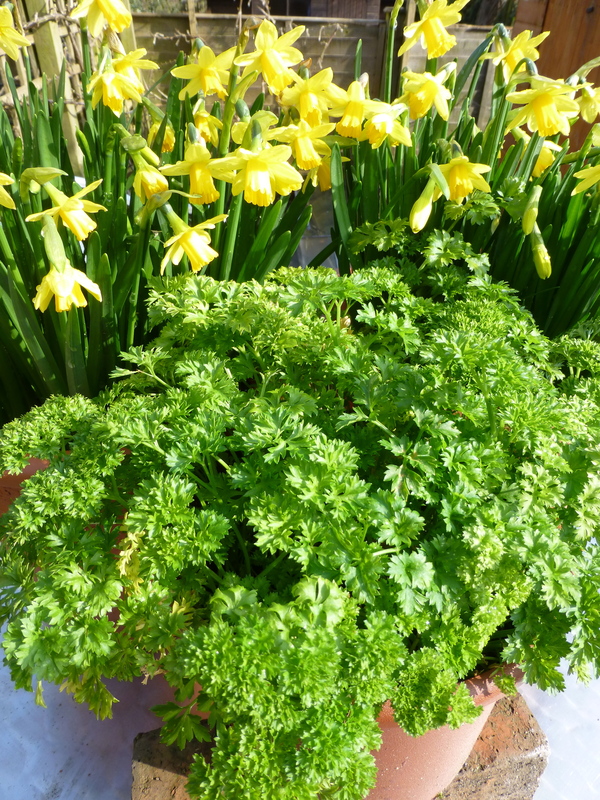 I vary according to the herbs etc that are around at the time so that they totally reflect the seasons… the combinations are as extensive as your own imagination. But here are the basics; encouragement just to have a go. Cook your veg in good stock, having fried off onions / garlic / spices (bacon bits if you’d like…) then blitz with enough added liquid (more stock / cream…) until you have the consistency you need. Serve steaming hot or chilled; garnished or not. You just need a powerful blender, a big lidded pan, and a wide imagination. Gently fry off 1 Onion & 1 plump clove of garlic in just enough olive or sunflower oil. Sweat with the lid on the pan for a little while. If you have, you can add: Stick of celery, peeled, chopped carrot, herbs that compliment tomato such as thyme, basil, marjoram, bay… If not vegetarian you may like to add a little bacon / chorizo… put a lid on so they all gently steam until soft. Add 2 tins of tomatoes – cook for a while with the lid off, to allow flavours to develop. Add well-flavoured vegetable stock, depending on how thick you want the soup to be: blitz as you’re doing this so you can judge the finished consistency. 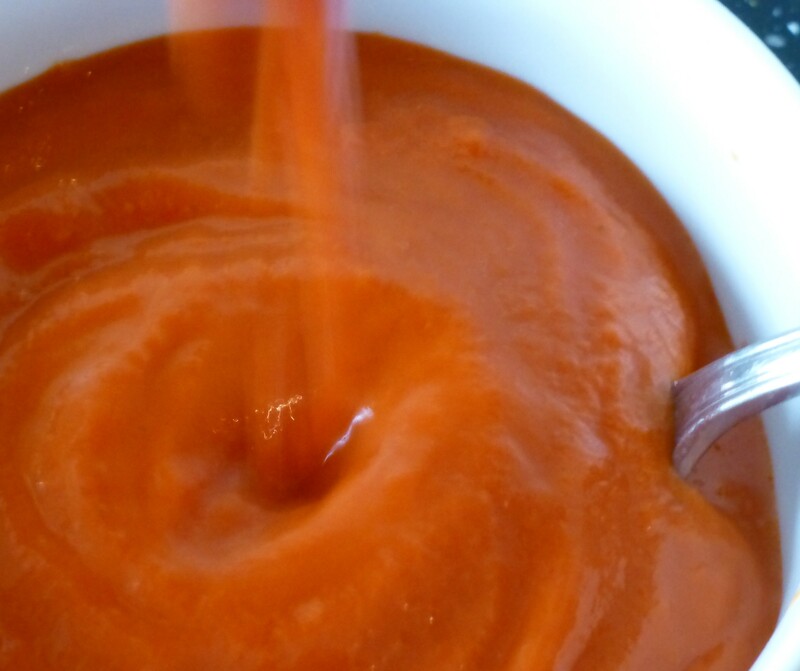 If you want tomato sauce to serve with beans, roasted vegetables, fish or poultry, blitz smooth or chunky and you may want to reduce down rather than adding extra stock. Add capers / chopped olives / gherkins / chopped soft herbs such as basil or chervil and seasoning to taste. 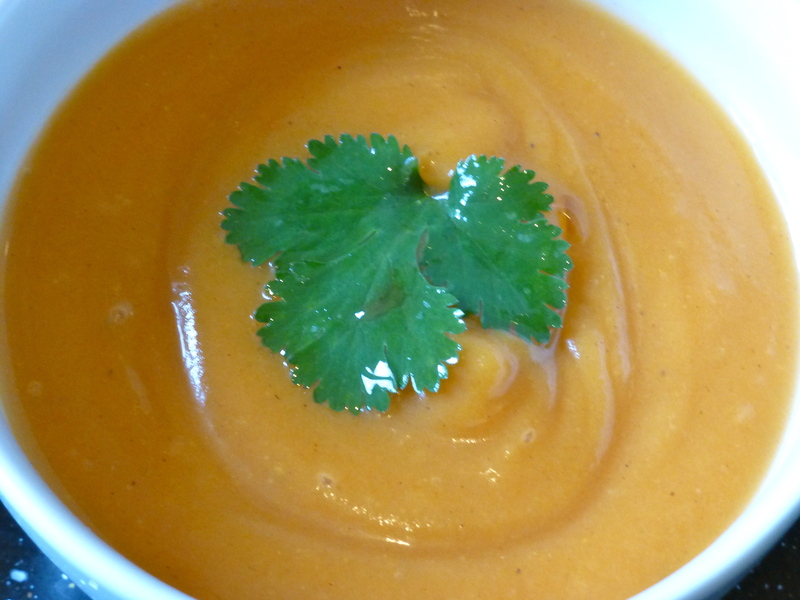 Sweet Potato and Butternut Soup. I love this, particularly as a winter warmer – the golden colour and smooth texture are as comforting as this soup is healthy. Sweet Potatoes are packed with Vitamins B6, C, D, Iron and Magnesium. Great for skin, healthy bones, heart and energy; they’ve also been linked with cancer toxin reduction. As a significant added bonus, they apparently promote healthy red and white cell production, which increases immunity to disease and stress. Wow – who needs vitamin pills?! Nigella Lawson’s recipe is a great starting point – vary as you like. Again, no rules here. Fry off some onion in oil (or butter if not dairy free and like the taste). Add around 200g frozen peas and 200 ml good vegetable stock. Gently simmer, with herbs if desired, with the lid on for a few minutes. Blitz in a food processor. Adjust quantity of stock and seasoning until you have the consistency and taste that you like. 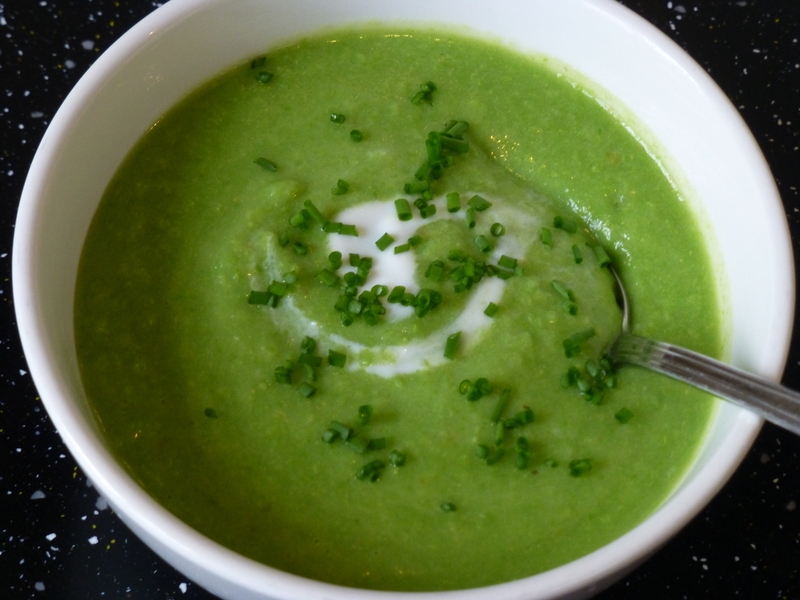 Serve hot or cold – with sour cream and snipped chives, mint (especially good added to chilled pea soup in the summer), or topped with ham lardons for non vegetarians. I’ve just planted some beetroot seeds, so am looking forward to beautiful deep purple Borsch later in the summer. Couldn’t be easier – What’s your favourite soup? 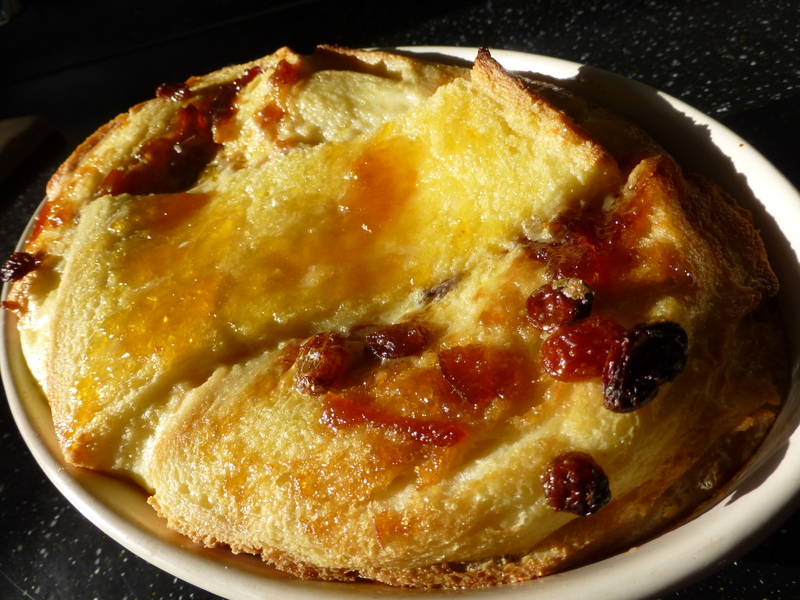 Thrifty Bakes… two very different but equally comforting Bread Puddings. We used to save up all the crusts and ends of loaves to take to the park at the weekend and feed to the ducks. A fond memory, but it doesn’t happen any more – mainly because of the rat problem which has meant that park keepers leave notices requesting that visitors don’t feed bread to the ducks. The fact that the girls are now well into their teens / twenties probably has something to with it as well! So now one of our top ways to use those leftover bread / bun leftovers is for bread pudding. 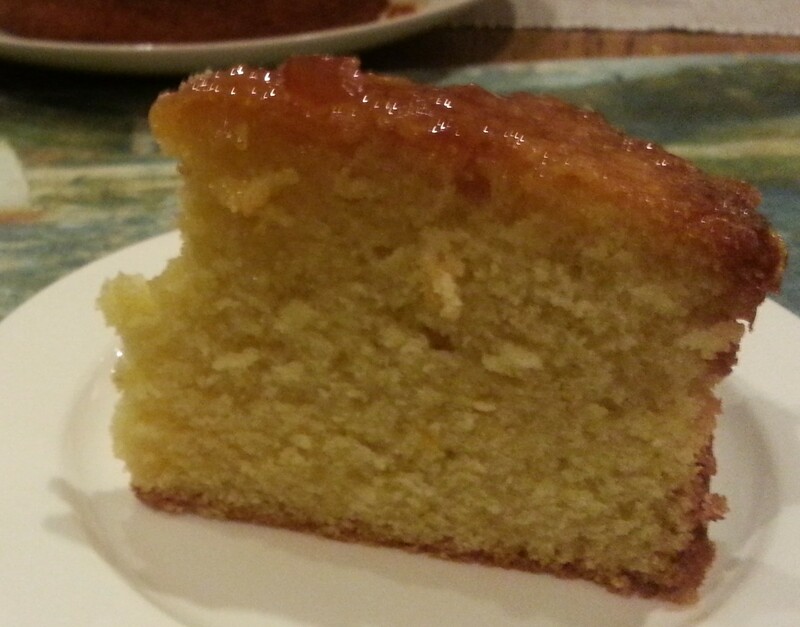 A traditional desert – layers of bread with butter and jam set in a vanilla custard. A fun way to use up those last bits of jam in the pots – or ring the changes with marmalade instead. Holly loves it cold for breakfast too, with lots of dried fruit suspended in the rich custard. This is based on Delia Smith’s recipe – vary it by adding more mild / less cream if you’d like a lighter custard – or a few drops of vanilla essence into the custard (or almond essence, especially if you’re using apricot jam). Make it in a well buttered rectangular / oval lesagne type dish approx 18 x 23cm (7 x 9″). I always try to remember to get the butter out of the fridge the day before so it’s good and soft for spreading. Serves 4 – 6. 10 g (1/2 oz) whole candied lemon or orange peel, finely chopped – omit if you don’t like it. Whole nutmeg / vanilla / almond essence. Preheat oven t gas 4, 350F, 180C. Spread butter and jam over the bread slices, right to the edges. Cut bread slices into quarters and arrange one slightly overlapping layer over the base of the dish. Sprinkle over candied peel and dried fruit. Cover with another layer of bread and dried fruit. Mix eggs in a big, wide jug or bowl. Whisk in cream, sugar, milk and flavourings. Pour over the bread & grate some fresh nutmeg over the top. Bake in the centre of the preheated oven for 30 – 40 minutes. Remove and leave for 5 minutes before serving with thick cream. – Try substituting one egg for 2 extra yolks or some of the milk for more cream to make it richer. This is real comfort food – make it simple and it’s easily digested too, so good if you’re feeling a little fragile. 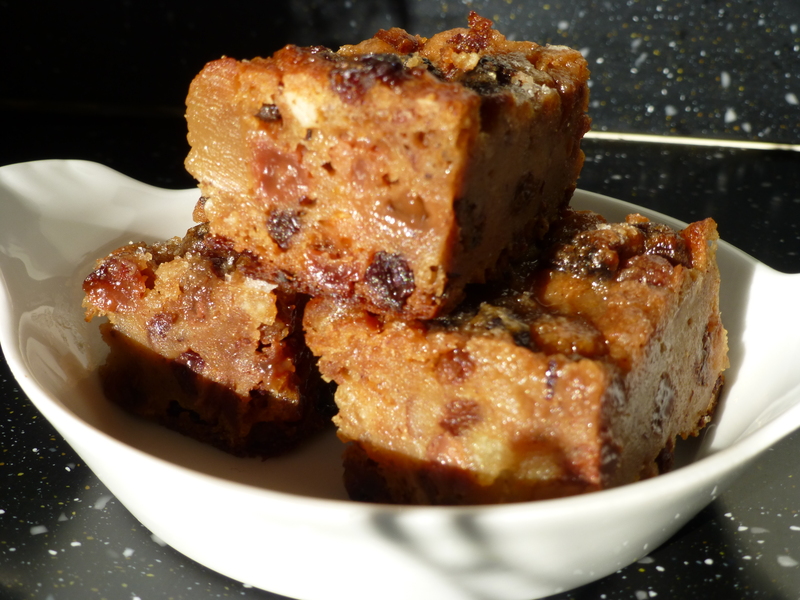 Bread Pudding is quite different – mosit, heavy, spicy and with a decidedly winter feel. Serves around 6. Use a baking tin similar to a deep flapjack tin 15.5cm x 20cm x 4.5cm deep. (6 1/4″ x 8″ x 1 3/4″). Line the tin with parchment paper, or butter it well. 225 g (8 oz) Stale brown or white bread, crusts removed. You can also use stale buns, hot cross buns, or similar. 2 teaspoons ground mixed spice. Place dried fruit and candied peel into a bowl with the brandy. Leave to marinade. Break bread 1 cm pieces and place in a separate, large bowl. Pour the milk over, stir and leave to absorb for about half an hour by which time the bread should be well soaked. Preheat the oven to gas 4, 350F, 180C. Make sure there is a shelf in the centre. Line tin. Beat eggs with a fork. Mix in melted butter, sugar, mixed spice and add to marinated fruits. Add oragne and lemon zest. Add soaked bread and mix gently all together. Spread into the baking dish. Sprinkle with demerara sugar and freshly grate some nutmeg over the top – not too much! Bake on the centre shelf of the over for around 1 1/4 hours. If serving as a desert, eat hot with brandy cream (whisk some brandy and sugar into double cream until thick and gloopy). History of bread puddings – our ancestors throughout the ages have been inventive in an effort not to waste food. 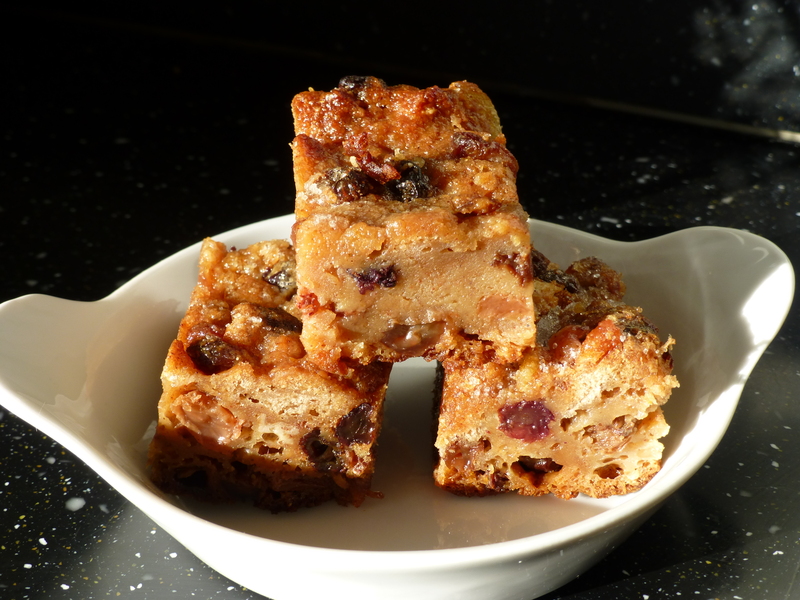 There is evidence that the Romans made a type of bread pudding with milk, fat and sugar – although they didn’t use eggs to make a custard, so it would have been denser than the recipe above. Ancient Egyptians reportedly made Om Ali, an Egyptian version, from bread, milk / cream and raisins. This is a cheat’s recipe – very quick, easy and made with usual store-cupboard ingredients. If you are making it in the late spring or summer and are growing chard or spinach, put some leaves in at the last minute. 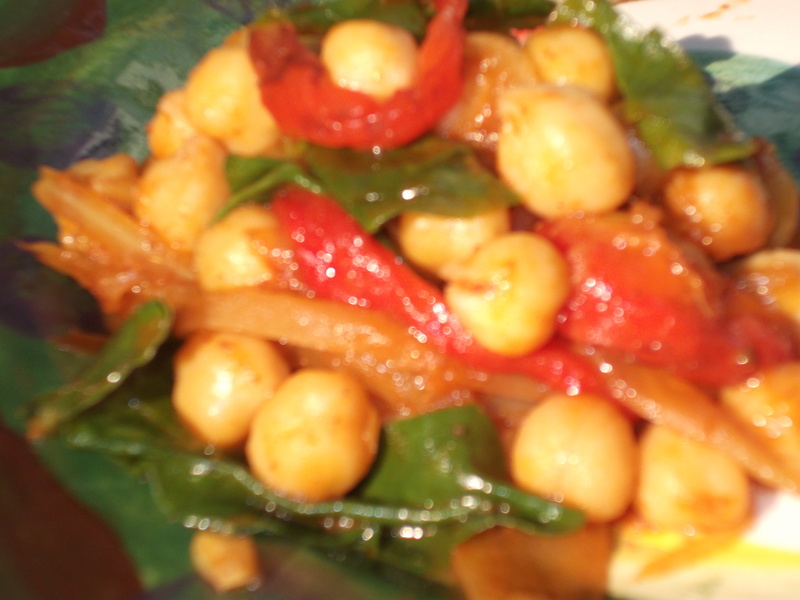 400g cooked chickpeas – soak overnight then cook according to packet instructions – or use tinned for speed. Fresh Chard or Spinach leaves to finish – or use coriander instead. Gently cook onion in oil in a covered pan for about 8 – 10 minutes – this makes it lovely and sweet. The pan cover should mean that it sweats but does not burn, but do check – it will need the occasional stir. Uncover and add ginger, chilli, garlic and curry. Cook, stirring occasionally, for a couple more minutes. Add chickpeas, tomato sauce and water to make a curry-like consistency. Simmer gently for about 5 minutes then add lemon and season to taste. Stir in chard or spinach leaves just before serving – if you add them any earlier they may lose their lovely dark colour. Sprinkle with chopped coriander to serve. 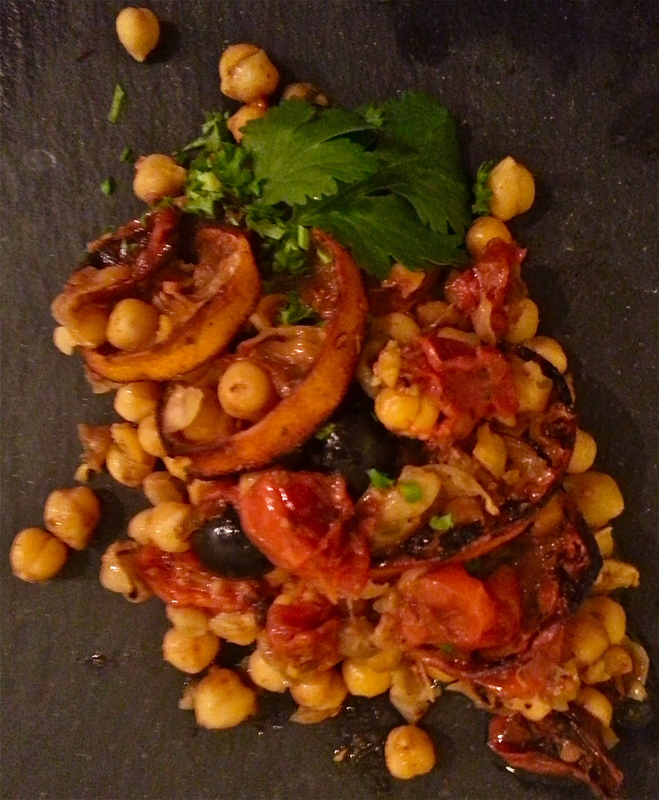 I also garnished with strips of skinned pimento (see ‘tips’). (Based on a recipe by Hugh-Fearnley-Whittingstall).